There are not only chocolate eggs with surprise, but also meatballs! 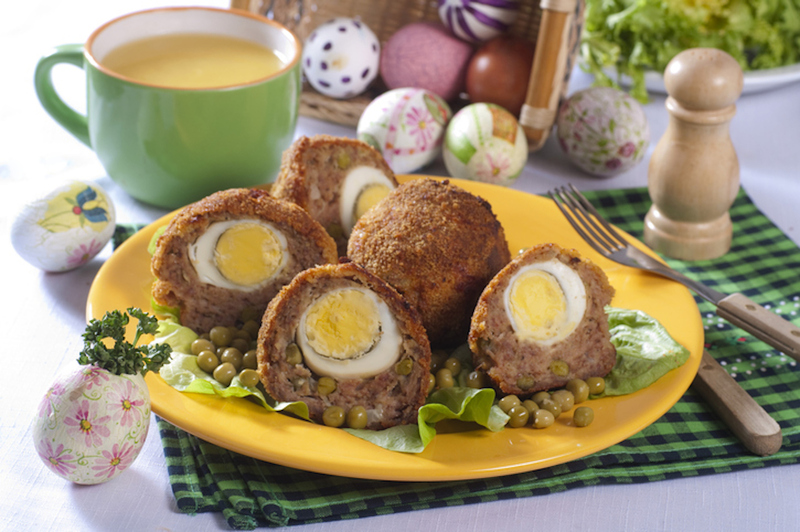 They hide an egg inside and are a perfect second to insert into the Easter's menu. To see them they seem very complicated to prepare because there is the outside meat, but inside a boiled egg. Actually assembling everything is very simple. The dough is the classic one of meatballs and is prepared with mixed minced meat, eggs, parmesan and breadcrumbs, then inside you can place a boiled egg, but also gravy and vegetables. First prepare the hard-boiled eggs. Just dip the eggs in a saucepan with cold water and bring to a boil. From this moment the eggs cook for about nine minutes. Then drain and place them under a jet of cold water to stop cooking. Peel them gently and use to stuff the meatballs. The mixture of meatballs is prepared by mixing 500 g of mixed minced meat (veal and pork), a large whole egg, two tablespoons of grated parmesan, salt, pepper, chopped parsley with a knife and if you like a slice of garlic crushed and reduced to cream. Add the breadcrumbs slowly, just enough to reach the right consistency. Then take some meat dough and cover a whole boiled egg. Once the meatball is ready, pass it first in the flour, then in the beaten egg and finally in the breadcrumbs to obtain a golden, crispy breading that does not break during cooking. Fry the meatballs in hot oil for a few minutes and then drain on absorbent paper. They are also good cooked baked at 200 degrees for about 20 minutes, but they will remain a little drier. In addition to hard-boiled eggs you can add, as we have said, of vegetables such as peas, zucchini and potatoes, or in the mixture of meat or in the form of cream inside the meatball. How to do? Put the meat mixture into the palm of one hand, flatten it to fill it. Put a spoonful of vegetable cream in the center and then the hard-boiled egg and close it adding more meat if necessary. Then bread like in the previous recipe. An alternative to the hard-boiled egg can be the cheese. Choose one with a soft dough such as fontina, taleggio or even scamorza, so that it melts during cooking, creating a warm and soft filling that children generally love.